J.E.Dyer: NBC asks Sarah Sanders if Trump owes Mueller an apolog: “Democrats accused Trump of ‘treason.’ “……! – The Tundra Tabloids……. J.E.Dyer: NBC asks Sarah Sanders if Trump owes Mueller an apolog: “Democrats accused Trump of ‘treason.’ “……! 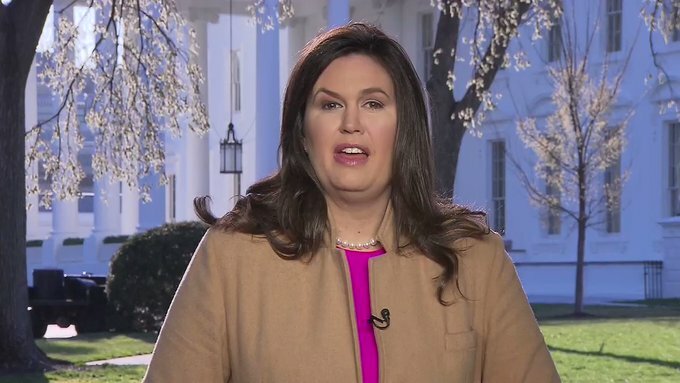 Sarah Huckabee Sanders swung back hard on Monday at NBC’s Savannah Guthrie in an interview in which Guthrie asked if Trump owed an apology to Robert Mueller. “Did Robert Mueller deserve better from the president than this kind of language and behavior?” she asked. “Are you kidding?” Sanders responded, saying that Trump’s rhetoric “matches” that of the media and Democrats. Previous Post Previous Post Finland: Reform candidate attacked in Helsinki by rampaging Kurds, received broken arm, Somali candidate talked mean to, given push……..
Next Post Next Post Finland’s largest film distributor Finnkino pulls Finns Party 6 min campaign ad, now says “it crosses the line”…….